Capture su viaje único en la Ciudad de las Luces con fotos profesionales tomadas por un fotógrafo profesional que sabe exactamente dónde obtener fotos únicas. Disfruta de una sesión fotográfica privada de 1 hora, ideal para familias, fotos de compromiso y vacaciones con amigos. Elija entre varios lugares emblemáticos en el increíble paisaje urbano de París; la Torre Eiffel, el Louvre, el Jardín de las Tullerías, o un monumento de su elección, pueden ser su telón de fondo. Fotógrafo profesional te ayuda a elegir el lugar perfecto para tus fotos. Elija su propio fondo de interior o exterior de París y reciba 50 fotos editadas profesionalmente. Paulette was Amazing......she is friendly, patient and professional. I highly recommend this Photoshoot with her. We received the best service and photos that is stunning!!!! I truly can't say enough great things about our experience with Paulette. She was communicative in the planning stages, making sure we knew exactly where to meet her and were prepared for the day. The shoot experience was easy. She gave great direction and was very friendly and warm. We just got our images today and they are truly INCREDIBLE. She made us look SO good. It was worth every penny to have this beautiful, cinematic images to remember our amazing adventure in Paris. 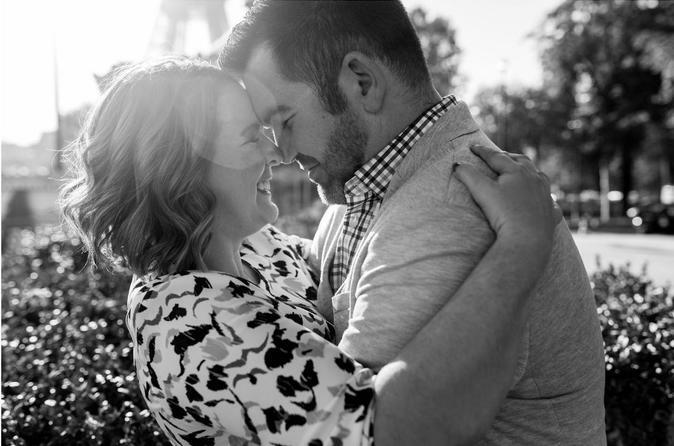 Paulette was absolutely amazing as our photographer for our surprise engagement photo shoot. She is so patient and very knowledgeable at her craft. This was our first ever professional photo shoot, and definitely wont be our last. Thank you so much Paulette, we absolutely love our pictures. Paulette is a fantastic photographer! She guided my entire family through the Photoshoot and told us how to pose and what to do so the photos turned out so effortlessly beautiful. The location was perfect with the Eiffel Tower in the background. She was very easy to get a hold of and very sweet and caring. My family and I had a great experience and will definitely book her in the future. I highly recommend her to all my family and friends! Paulette contacted me via email soon after I booked my photoshoot, and we confirmed the meeting time. She also contacted me a few days before our scheduled date to confirm the time and location. She provided me with her cell phone number in case I needed to contact her immediately. Great communication! It was very hot on the day of our scheduled photo shoot. She offered to reschedule for later in the day so it would be more comfortable, but we didn't have the available time in our schedule to meet later. She was very polite and friendly, and she made the photoshoot really fun! We took pictures at several locations around the Eiffel Tower, and they turned out gorgeous! She had them ready within a few days. The hardest part was choosing which ones to keep! What a great experience! Our photographer Paulette was very professional, patient and was very receptive to how we wanted the photos. Without her we would never had this location for the photos. She also always replied to our emails and guided us to the photo shoot location. Thank you for our beautiful family photos! Paulette did a great job with our family photos. We have our photos taken professionally every year around my sons birthday, and thought it would be fun to do this years shoot in Paris. We received a variety of poses with the Eiffel Tower in the background. There were a lot of photos that were ALMOST fantastic I.e. one of us was looking away, not smiling, blurry, and I wish that more photos had been taken to get those just right, or that we had received some more direction. However, as a whole, we got several really good shots and were pleased with our photos. Paulette was really easy to work with and very responsive when I had questions about the photos that we received. Its SOOOOO nice to have professional photos of my familys trip and not just our terrible selfies. Its something we will cherish forever. One thing to note is that this is an hour long shoot, so you can pick one location. Its not really a tour, as the marketing text on Viator leads you to believe. But you do walk around the spot that you choose to find different backdrops and angles, so you have a variety of photos. Had an amazing experience with Paulette, our photographer. She was well organised, showed complete professionalism and made this experience fun and well worth it. She captured moments for us that we could never have had without her. Memories to treasure forever. A BIG thank you Paulette. I really wanted some professional quality portraits from our vacation. It was a great experience to not worry about having to take photos ourselves. Paulette was great and took really amazing photos with lots to pick from. Wonderful experience! Thanks so much!